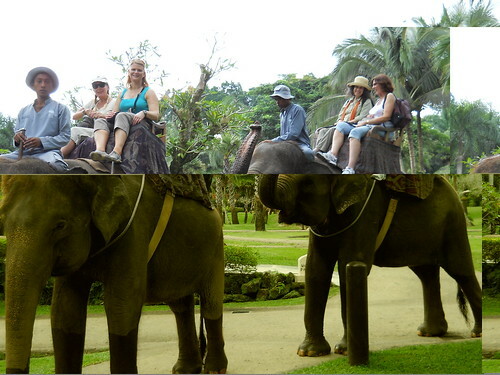 One of my fellow travelers, Denise, did some research on other things to do in the area and one of them was Elephant rides at the Elephant park. She suggested this the night before and three of us decided to take her up on it. Our tour leader arranged a van from Tour East to pick us up, wait for us and bring us back. This was a great experience and I am so glad that I did it. Getting there was half the fun. My observation of driving in Bali, its a never ending game of chicken. While some roads have line markers, it doesnt really matter as people tend to drive right down the middle and just get out of people's way at the last second. Motor bikes are constantly weaving in and out of traffic. Pedestrians - - you do not have the right of way and its up to you to get across the street alive and in one piece. Can you imagine the road rage if people drove like this in DC? This next video shows one of the villages as we drove by. The house compounds are built right up to the side of the road. We even saw a woman doing her laundry in the irrigation ditch that run along the side of the road and in front of all of the houses. 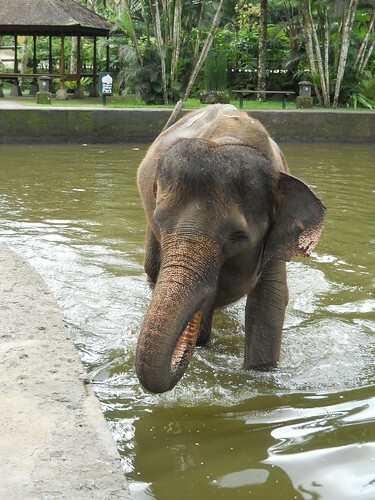 Once we reached the village where the elephant park was located, we had to make a donation to enter the village. Yes, a toll to enter through the village gates. There was no set amount, whatever we had, a dollar each perhaps. I think that is what we each threw in. 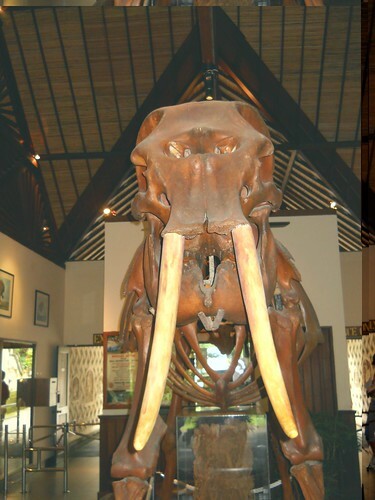 The Elephant Park also had a museum, hotel/resort, gift shops and restaurant. Below is a photo of a HUGE elephant skeleton. FYI, I apparently missed the "No Photography" sign posted near the entrance of this room, whoops. I had to laugh because we give people such a hard time when they flash photograph the Iwo Jima flag...how can they miss the signs. This room allowed no photography what-so-ever. I think they need to put the no photography sign right infront of this elephant. 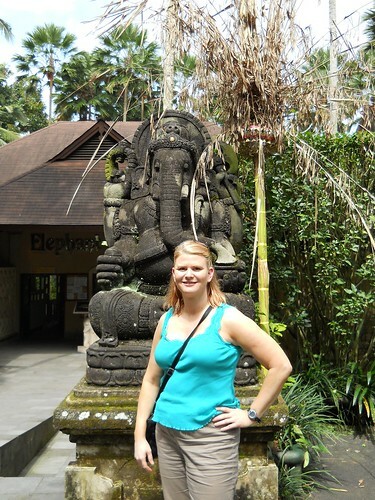 The above elephant was so large that I could have walked under its belly without slouching. I think the artifact below was in an area of the museum where we could photograph. 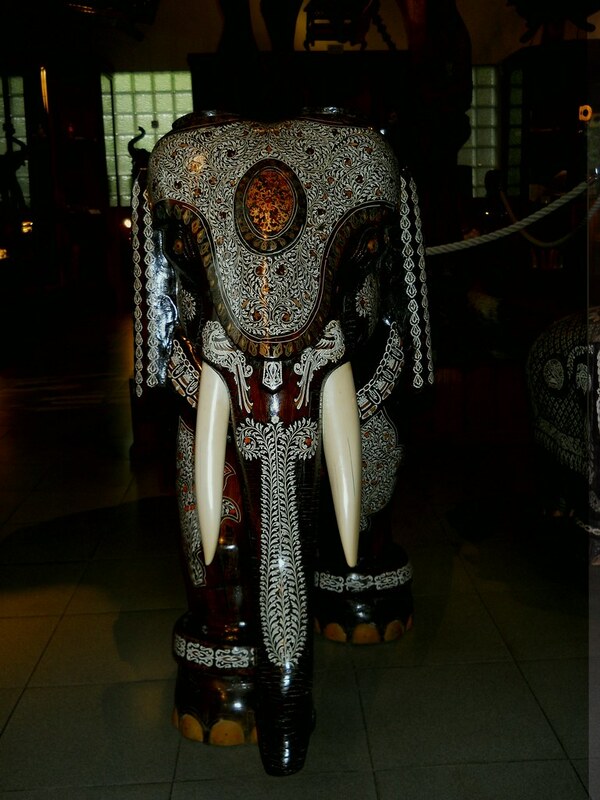 This is a wood carving with intricate, beautiful painting all over the elephant. We didn't spend much time in the museum as we needed to take our ride and get out of dodge to be back at the Alila to catch the bus to the Market. This is a photo of the park. It was very beautiful. 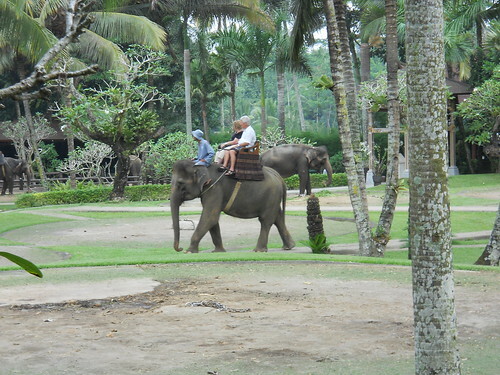 We were greated by a park Ranger who hustled us over to the elephant rides. As we walked to 'loading dock', this little baby walked up to us. She wanted to be petted and to check us out. 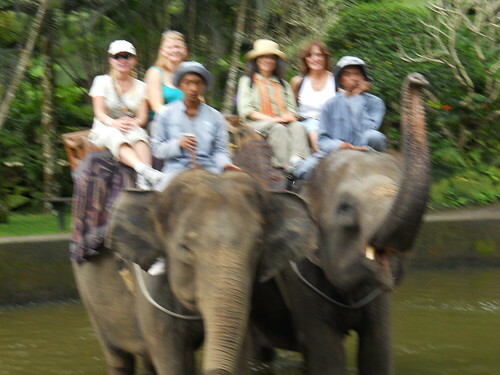 Below is a blurry picture taken by the park ranger my group on the elephants. This would have been a cool picture had my camera not done this strange break-up of the image. If anyone knows why this is happening, let me know. The name of the elephant I was on was Dina. She was a nice elephant. Our driver spoke english very well and we had a great conversation as we road through the trails. Below is some video of our ride. Right before I started to video tape this, Dina came to a dead stop in the trail, flapped her ears and made like she wanted to back way. We asked the driver what was wrong. You may be able to hear the gamelon music, at one point it was very loud, the village must have been walking by at the intersection at that time. Dina is afraid of the music. The driver turned her around so that we could take pictures of each other (the other two gals were right behind us on their elephant). Once the parade passed, Dina moved on. I'll be honest, the ride was not comfortable. The seats had a wooden bar across the back that hit you right below the small of your back. So as you lumbered from side to side, the wooden bar would hit your lower back in a very uncomfortable place. 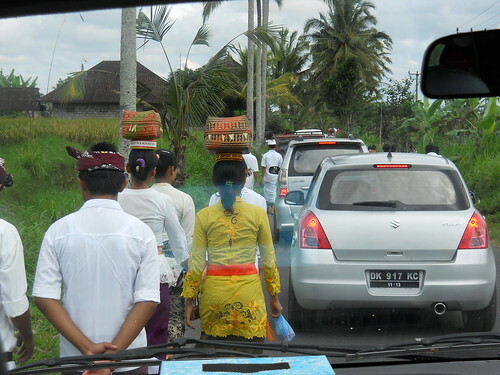 Along the path, we noticed Balinese standing at intersections taking our pictures. It wasn't until after and we were leaving did I fully understand. 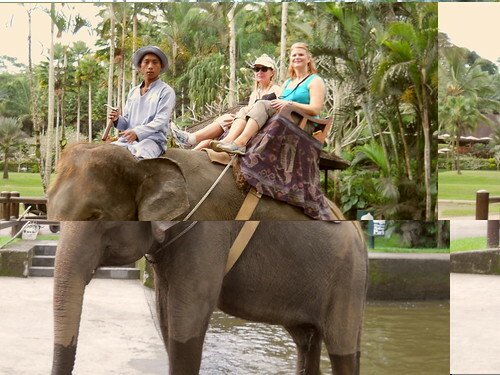 They probably could not afford to take the elephant ride (it was $58 US dollars a person which was 580,000 rupia) so they did the next best thing, they took pictures of the westerners riding the elephants. I'll be honest, this kind of made me sad. 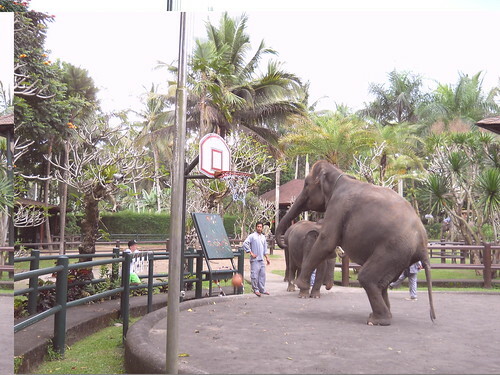 After our ride, we took in the elephant show. 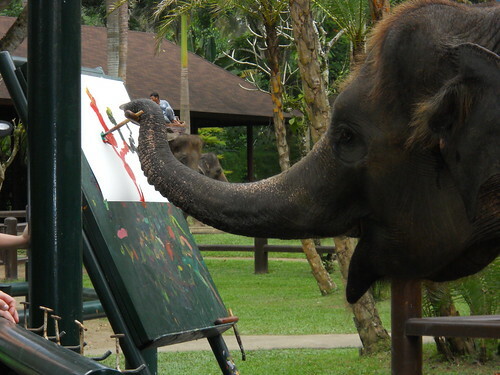 Here is some video of the elephant painting. 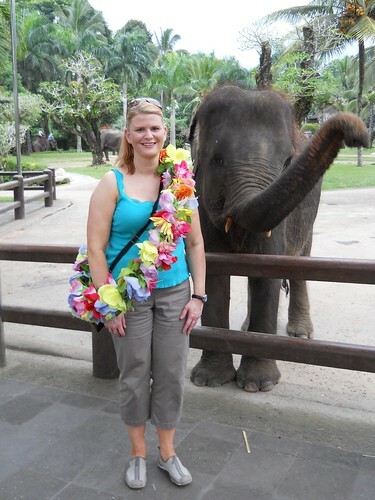 After the show we went to have our photos taken with the little elephant that had greeted us when we entered. Such a sweeet animal. I scratched her trunk and behind her ears. The skin on its face and trunk is very hard. Not even leathery. Its more like living stone, that is how hard it is. The skin behind their ears is quite soft, similar in texture as the skin on my arm. Our drive back to hotel was kind of long as we got stuck behind another religious festival parade. The boxes on the women's heads contain the offering. Much of what is in the offering is actually the family's dinner. They will make the offering and get the meal blessed and eat together as a family on the grounds of the temple.